this little baby was worth $150. . . I've seen lots of these KitKat cakes popping up on Pinterest, so I thought I would give it a try myself. Bake a two layer cake of your choosing. Frost the middle, top, and sides with chocolate frosting. Place unwrapped KitKats along the cake sides. Cover the top with small candies. I used M&M's. (Optional) Tie with a coordinating ribbon. The cake is great to make if you have little helpers around. My little guy unwrapped all the KitKats and helped me place the M&M's on top. Anyone else make this trendy cake yet? Yum. Gotta love a cake covered in sweets. The Boy Scouts must have been really pleased to see you turn up! Thank you so much for visiting my blog. I really appreciated your comments on my photo. I am enjoying reading yours. Wow! That is a show-stopper! I so would have bid on that one! Great job! Work of art! And, I bet it is super yummy. Your cake turned out great! I will have to remember that idea for the next time my son's Boy Scout troop holds a bake sale auction. Gr8 idea, think I will remember that next bake sale! I have seen this many times on piniterest and have pinned it quite sometime ago. 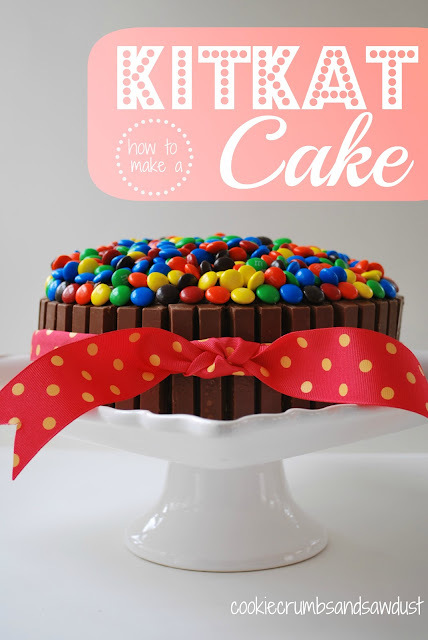 I have loved the look bc like SayNotSweetAnne my family LOVES kit-kats so I have wanted to make it, think have inspired me to make this cake, perhaps for my son's birthday in June we are doing a Vintage Sock monkey so the colorful topping of M&M's will be soo super cute! Thanks for sharing Laura! Your blog is very cute I will be stopping by frequently! Love this! Thanks for stopping by our blog! We are your newest follower! This cake looks so fun! My kiddos would love it! Cute idea and fun to make too, I'll bet. I have several birthdays coming up this month. I'm pinning this idea for future reference. Thanks for sharing it. Whew...if that does not make a mouth water not sure what will. Fantastic! Thanks for sharing with the newbie party. I've been wanting to make the Kit Kat cake for some time now but I don't have an excuse to make one. You did a fabulous job on yours!! This is lovely. I love how elegant it looks and that it requires minimal cake-decorating expertise. Thanks so much for directing me over and for visiting my blog. This is beautiful. My daughter made this a couple of years ago and it was a big hit. Thank you for sharing. Beautiful job!! Glad it was a successful cake auction entry. Im sure this cake flew right off the table! That's clever! THanks for stopping by my blog! Please stop over and link this up with our Tip Tie thru Tuesday linky... we are also holding a giveaway too! I'm sure everyone would love to see this! Oh my goodness, this looks so delicious! I'd love to have a bite of that! Love Kit Kats! Your blog is so neat! Thanks for visiting me! My mouth is watering just looking at them. I bet they taste great in person. I would love if you shared them on my link party. I've seen this cake all over Pinterest, looks amazing! This is such a cute cake. I will have to try this one with the g'kiddos. Thanks so much for stopping by the Back Porch. This cake has been on my to-do list for a long time, but I've yet to try. Yours turned out perfectly! Visiting you from the Cozy Home Party. wow, this looks decadent. I'm adding to my "beautiful desserts" Pinterest board right now! So cute. How can you beat that? Cake and candy all in one, I bet it Tate's as incredible as it looks! What a neat cake! Glad it brought in a large donation. Great job! Looks AMAZING!! New follower! I would love if you would stop by shabbygals.blogspot.com for a visit too! Thanks for linking to Take-A-Look Tuesday - - you were featured today!! I too have seen these cakes around - I must try it one day - Yours looks great! Hi Laura! Thanks for stopping by my blog and leaving me a comment! That cake is really awesome! No wonder it was worth 150 dollars! That is gorg and I'm sure tastes even better than it looks. Great idea that would impress any crowd! I have made this cake too and love how it turns out. It is super fun for kids. Thanks so much for linking up to Creative Thursday this week. Great idea, it looks fantastic, both kids and adults would love, thanks for sharing. Looks so yummy! Thanks for linking up! Hi, I just saw your Kit Kat cake on Pinterest and came over! This is awesome! I'm hosting a linky party called Southern Sundays and would love if you would link of this excellent dish! www.asliceofsouthern.blogspot.com Hope to see you there! And I love your blog...! This is my kind of cake decorating! I'm featuring this on my Show & Tell superstars pinterest board - thanks for linking up! I love it! The cake and photo is so beautiful. I've never really decorated a cake, but this is definitely something I would give a try. Thanks for sharing. This is being featured this week at Lines Across. You did an awesome job on this cake. What a beautiful photo too! Completely amazing! I love this idea! I have a monday linky & would love it if you have the chance to stop in and share this great cake. Thanks! This looks so so so good. I think I need one! Thanks for sharing Tout It Tuesday! So simple and so beautiful! I'm another HUGE Kitkat fan!! Thanks for visiting my blog and inviting me to visit yours! Wow, how creative. I would have never though to use kit kats on a cake. Thank you for sharing at Saturday Show and Tell. I hope to see you back this week. Thanks for joining Southern Sundays with this wonderful recipe! I'll be announcing the featured recipes next week. Hope to see you at the next party with another great item! Thanks for linking up to the Piece of Cake Party! Great job on the cake! I made one for my daughter's high school graduation luncheon and it was GREAT! I got the instructions at The Texas Monkey (blog). You can do this same idea with piurouette cookies and strawberries - cute for Mother's Day! I made the cake! I featured you on my post today. Thank you so much for the inspiration. The cake was a total hit and definitely had that "wow factor"!